Sunbeam 5-Tier Shoe Closet Just $22.99! Down From $43! You are here: Home / Great Deals / Sunbeam 5-Tier Shoe Closet Just $22.99! Down From $43! Staples has this Sunbeam 5-Tier Shoe Closet on sale for $22.99 (Reg. $43)! Plus you can get FREE shipping and 5% back in rewards if you are a Staples Rewards Member or you may be able to FREE in-store pickup! 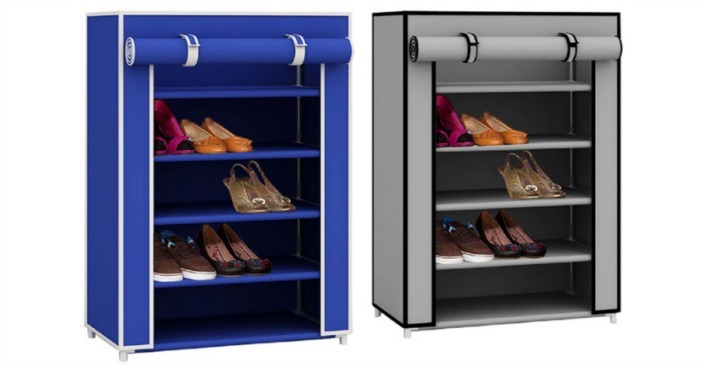 Arrange up to 15 pairs of shoes on this portable closet’s five tiers. A fabric door can be rolled up and down as necessary when you want to select a new pair and when you want to keep the shoes out of sight. The product stands at 23.6”x11.8”x31.5”. Thanks & Photo Credit, Free Stuff Finder!